Happy New Year everyone! Sorry for the sporadic posts these past couple of weeks, I've been trying to take a real vacation from everything. And then on top of that I managed to ring in the New Year with a nice case of food poisoning. Not the pretend 'hangover' food poisoning that people have been accusing me of, but the real thing - it's pretty miserable. But I'm back! And hoping that 2010 is going to be an awesome year. So if you didn't have enough to drink on New Years Eve, you'll be happy to know that the Boston Wine Festival starts this Friday 1/8. There are so many great things to see/experience this year, which happens to be the 21st installment of this particular event. Chef Daniel Bruce and the Boston Harbor Hotel will be featuring a series of food & wine pairings and a bunch of very well known wineries will be in attendance: Opus One, Ravenswood, an evening of Bordeax's. 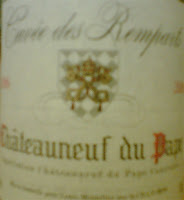 Sadly, the Chataneuf du Pape event is sold out already, that's my favorite wine. They've got events going on all the way through April so you should be able to find something that you like. 0 Response to "Boston Wine Festival 2010"